Home » DAMAGE HAIR » HAIR BREAKAGE » DAMAGE CONTROL....STOP HAIR BREAKAGE NOW! 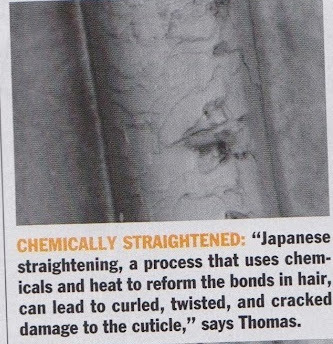 DAMAGE CONTROL....STOP HAIR BREAKAGE NOW! A recent Unilever survey reported that 86 percent of the women said that damage is the number one thing that they want to change about their hair. Before I went natural I had hair breakage and damage galore. Now, I have occasional hair breakage, which I attributed to over using elastic hair bands. I have learned that in order to prevent unnecessary damage to my hair I had to stop blowdrying, flat ironing, hair dying, and even the innocent brushing because all can stretch and damage the hair shaft. 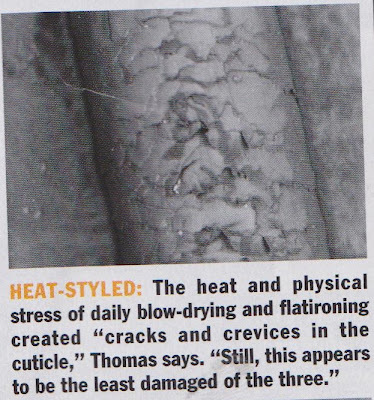 Mary P. Lupo, clinical professor of dermatology at Tulane University School of Medicine, explains that, "With damaged hair, the shingles of the top cuticle layer that usually lie flat are disturbed, or even ripped off altogether"..."The best thing to do is to stop disturbing them with heat, chemicals, and friction -- but there are some ways to smooth them down again". 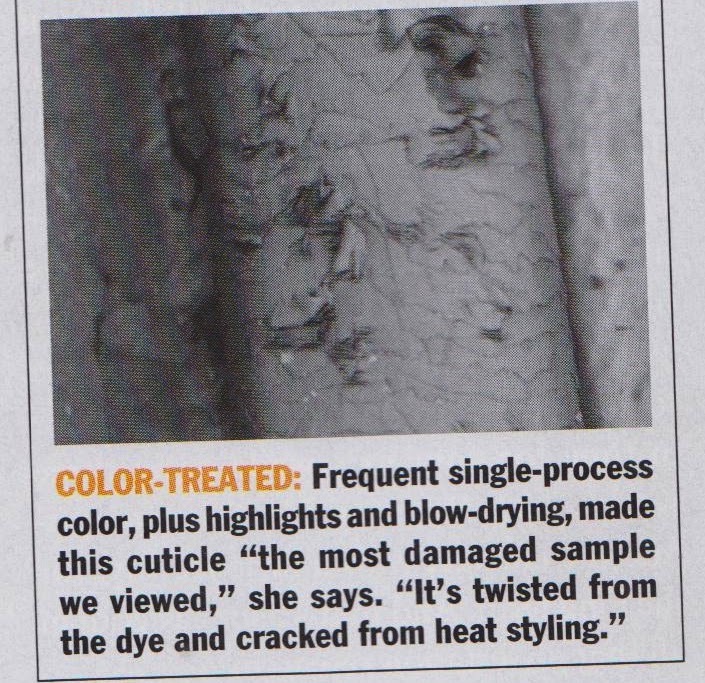 Our hair is incredibly strong and resilient fiber, however this fiber is compromised by daily styling or chemically changing our texture or color. When it's in good condition our hair is very elastic. It can stretch up to 30 percent beyond it's normal length and spring back. You can test your hair elasticity by carefully stretching a strand... then release...if your hair returns to its normal length with out breaking then your hair is in good condition. If it breaks then your hair has poor elasticity. 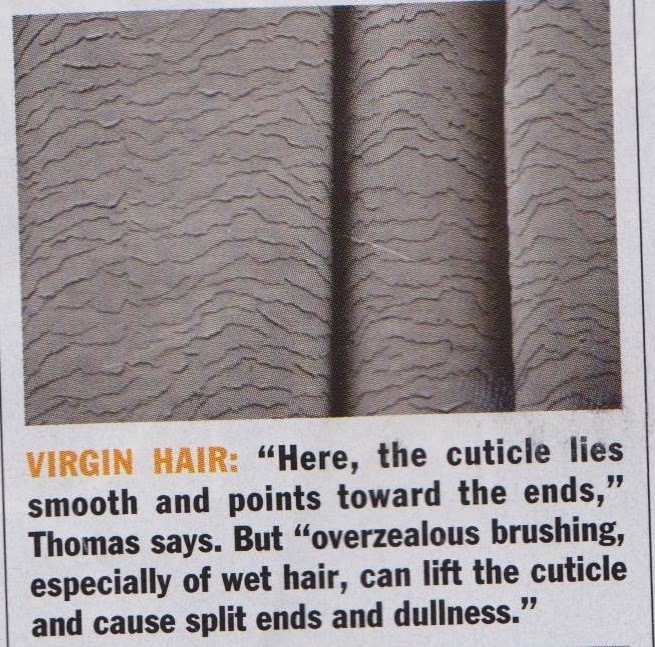 Poor elasticity means your hair is in need of moisture. Next, check your hair porosity, or it's ability to absorb and hold moisture. Healthy hair has the ability to absorb 50 percent of it weight in water. When hair is damaged, it loses layers from its protective barrier. You can use the sink-or-float test, to test the porosity of your hair shaft. Just take one strand of hair from the top, back, and two sides of your head. Drop these strands in a bowl of water, if they sink within 5 to 10 seconds, then your hair is overly porous. Such hair is very fragile and should be deep conditioned until the health is restored. 1) LET YOUR HAIR AIR-DRY: The heat from a blowdryer softens the keratin in the hair's core, essentially sucking out the moisture in our hair. Besides protein ( to strengthen and fortify), moisture (to hydrate) is the other essential agent that will be beneficial in treating hair structure both internally and externally. Damaged hair dries faster because it's so porous. If your hair is medium to thick and it takes less than an hour to air dry, then it's in trouble. 2) DEEPPREPOO: The natural oils of the scalp are what keeps hair looking shiny and healthy. By preconditioning our hair shaft we prevent these oils from being completely strip from our hair shaft by a harsh shampoo. Also make sure your shampoo doesn't contain harsh cleaning agents like sulfate. 3) STOP COLORING YOUR HAIR: I know this is a hard one to do, but bleaching is an extremely aggressive attack on the hair shaft, because it breaks down the waxy protective layer. Once the layer is gone it's hard to to make the hair look shiny and healthy. 4) ACCEPT YOUR GOD GIVEN HAIR TEXTURE: I know this is a touchy subject but if your hair is damaged then your relaxer or flat iron maybe the major culprits. Some experts believe that direct heat of flat irons cause the hair moisture that's inside of the hair shaft to boil. 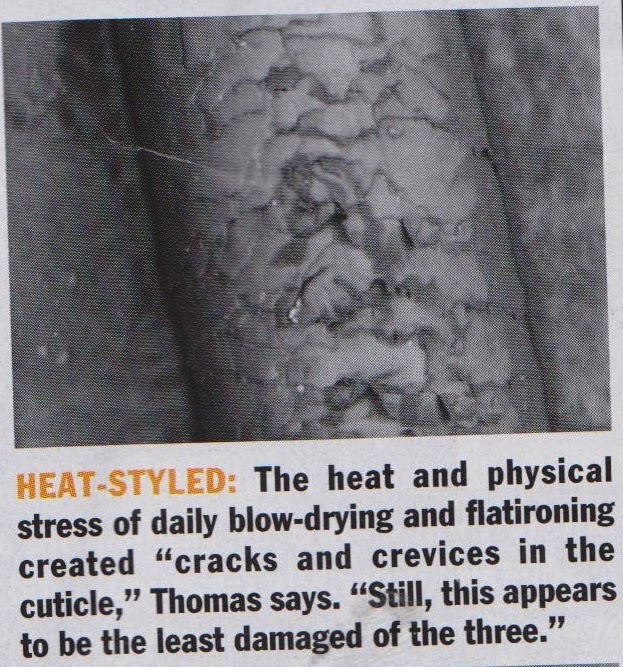 This creates a steam that erupts through the cuticle. Chemical straightening on the other hand, interferes with the disulfide bonds in the hair shaft causing the hair structure to disintegrate over time. 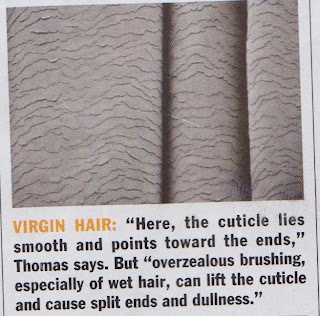 WHAT TYPES OF DAMAGE CONTROL HAVE YOU USED ON YOUR HAIR JOURNEY? ?